I recently attended a public cooking class called “Vegetarian Risotto Using 6 Different Grains,” at the Natural Gourmet Institute for Food and Health in New York, where (Brooklyn) chef Peter Berley demonstrated his techniques. 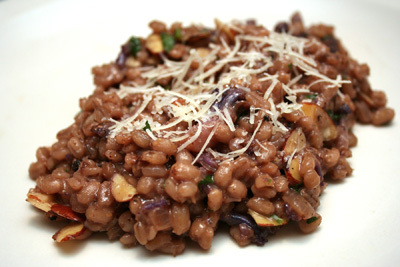 “Risotto,” is best discussed as a “technique,” where an uncooked grain (traditionally arborio rice) is sauteed in butter before a liquid stock is added in increments and the mixture is laboriously stirred while the liquid is absorbed. The process can’t be rushed and the stirring can’t be ignored. The favorable result of all this “work” is a creamy risotto that’s full of flavor and textural integrity. I enjoy the “single pot” method of risotto, although you will also have a “second pot” full of warm and ready stock on your stove top. As a chef stirring a risotto, I adore the marvelous aromas that swirl out of the pot as the meal comes together. It’s a reward and a treat to experience. So having explained the basic nuances of risotto preparation, I chose to make “Barley Risotto with Roasted Cauliflower, Toasted Almonds, and Parmesan” (recipe below), which exercises few of the traditional techniques. Combine the water and barley in a bowl and soak for 2 hours at room temperature or over night in the refrigerator. Drain. Place the cauliflower in a roasting pan and toss with 2 Tbsp. oil, season lightly with salt and pepper. Roast for 25 minutes, stirring occasionally until caramelized. Transfer the cauliflower to a plate to cool slightly, then roughly chop. Heat the remaining tablespoon of oil in a heavy 3-4 quart saucepan over medium heat until shimmering. Add the onion and sauté 5-7 minutes until soft. Add the cauliflower and ½ tsp. salt, stir to combine. Stir in the barley and add the stock. Bring to a boil. Reduce the heat and simmer uncovered for 30 minutes, stirring occasionally, until most of the liquid is absorbed and the barley is tender. Turn off the heat and stir in the butter and cheese. Season with black pepper and additional salt to taste. Serve risotto sprinkled with chopped parsley and toasted almonds. Pearl barley, it turns out, behaves differently than arborio rice. It doesn’t need all the stirring in order to be creamy. It does, however, benefit from a long soak, before cooking. I roasted a lovely organic purple cauliflower for this recipe, and this helped darken the color of my barley. I sauteed 2/3 of an onion for 5 minutes. After simmering the combined risotto for 25 minutes, I added 1/2 tsp. salt and 1/4 tsp. black pepper. Remember, you’ll be adding a nice amount of salty parmesan cheese to this risotto, so don’t over-salt it. My resulting risotto was deliciously creamy and smooth, showcasing a perfect risotto texture. We all loved eating it. If you haven’t yet indulged in the rewarding risotto process, it’s time to do it. Let’s make another vegetarian meal next time. I want to cook “Azuki Beans and Winter Squash,” from the October 2007 issue of Vegetarian Times, along with “Spinach Toasts,” from drweil.com. Come back to my site on Tuesday, May 26, to see what happens.